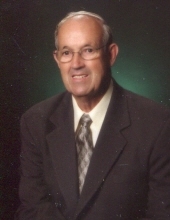 Perry Jordan, 84, passed away peacefully on Monday, April 1, 2019 at Kitty Askins Hospice Center surrounded by his family. Perry was born in Newton Grove on October 18, 1934 to the late Grover C. and Annie Reaves Jordan. He proudly served his country in the United States Army. Perry retired as a tree surgeon from Carolina Power and Light Company. He loved Northview Baptist Church in Goldsboro where he sang in the choir and First Christian Church in Rocky Mount and was a dedicated and faithful servant his entire life. Perry enjoyed gardening, watching sports and Nascar on television, and listening to old Christian hymns. Above all, he loved spending time with his family and friends, especially his grandchildren. He will be missed. The family will receive friends on Thursday, April 4, 2019 from 1:00 – 2:00 p.m. at Seymour Funeral Home followed by a service to celebrate Perry’s life at 2:00 p.m. in the chapel with Rev. Frank Purvis and Rev. John Browning officiating. Interment will follow in Hillcrest Cemetery, Newton Grove, NC with military honors. Perry is survived by his wife of almost 57 years, Norma Walton Jordan; daughter, Delia Parker and husband Donnie of Red Oak; son, Brad P. Jordan and wife Michele of Raleigh; and grandchildren, Jordan Perry Flowe, Trey Perry, Lauren Perry, Brayden Jordan, Preston Parker and Dylan Jordan. He is also survived by his sisters, Virginia Myers of Mount Olive, Ruby Kornegay of Mount Olive and Judy Goode of Grantham; brother, Jimmy N. Jordan of Atlanta, GA; special cousin, Marilyn Jackson; special friends, Rose Krieger, Garnett Walsh and George Glisson; and his k-9 friend and companion, Scotty. In addition to his parents, he was preceded in death by his sisters, Verna Jordan, Sarah Tyner, Betty Mozingo and Geraldine Darden and brother, Grover Jordan. To send flowers or a remembrance gift to the family of Perry Jordan, please visit our Tribute Store. "Email Address" would like to share the life celebration of Perry Jordan. Click on the "link" to go to share a favorite memory or leave a condolence message for the family.